Have you ever taken a close look at your life and wondered why you are really not becoming successful? At times we are putting in so much effort and yet we don’t see the results we want to give up. If you are one of them, then this post should definitely help you. 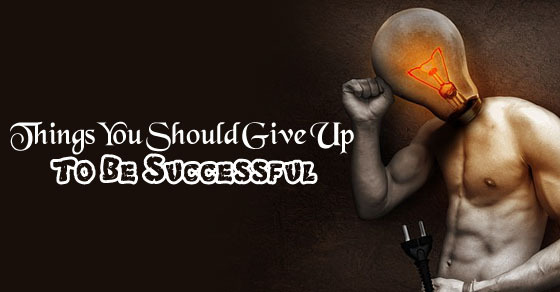 In this article, we are going to tell you the different things you should definitely give up in life in order to become happy and successful. So give it a good read and here’s hoping you will benefit greatly from the article! How to be More Successful and Never Give Up? There are some people who believe that comparing yourself with others is a good thing to do. It surely could be a great idea if the sole purpose was to compete. If you are able to give your opponent a reason to fight harder… in short if you are able to aspire them, then of course it is a good thing. But the biggest problem in most workplaces is that most people want to harm others in order to become successful. If you have been doing the same, you probably are calling trouble for yourself. Take our advise and give it up right away. And you will see better things in life for sure! People often refuse to change themselves, especially in situations where they are wrong. It is actually quite easy to act all tough and blame the other person but it takes a person of courage to admit their own mistakes and learn from them. If you can change yourself for the better, then there’s nothing like it. Its always great to experience something and then trying to make the most of it. If you need to change your pals, don’t hesitate. Bad friends are often the reason behind our failure. And if you have friends at work, make sure to leave them straight away. No, we aren’t saying you have to avoid them entirely. All we are saying is stop hanging out with these people. All they will ever do is weigh you down and fill your mind with negative thoughts. You really don’t want any of that happening, do you? Also remember that dwelling in the past can never help you in any way. Not only does it stop people from becoming successful but also ruins them in several ways. Living in the past is one of the biggest reasons why most people aren’t able to be happy and chase their dreams. If you are one of them, please change it. There are so many ways you can do this like: speak to a friend or someone you trust, get some therapy, read a good motivational book or spend time with those who make you happy! Also remember to stop blaming others. This is certainly not a trait you will find in any successful person in the world. Blaming is not just a bad habit but also makes you come across as very immature and also stops you from realizing your mistakes. Instead you should try coping with the person and be honest about the situation. You must also try to come up with a solution to the problem instead of provoking it. Some of us don’t realize how much complaining can affect us in life. Not only does it make us an angry and bitter person but also steals others happiness as well. So do yourself a favour and stop complaining about silly things right away. If you can do that, success will come running to you instead of you chasing it around so much. You may also try looking at all your problems in a different light. It will help you find solutions ever faster. Try it if you havent! Living in a meretricious world, we are often driven and made to work for longer durations in order to be promoted fast. And even though its very normal to keep pushing yourself in order to achieve all your dreams, please remember that working too much will never help you. Instead it will pull you down and make you feel unhappy. If you really want to be happy, spend some more time with your family and friends, give them space and go out with them during the weekends. It will make you feel refreshed. You should actually set yourself a long term goal and come up with a strategy as to how you are going to go about it. Step things up, work harder and before you know it…you will begin to see success coming your way. Being a pessimist will never help you honestly speaking. If you want to become more happy and successful in the future, you have to stop being a pessimist. People who are filled with negative thoughts in their mind are not half as successful as they want to become. So we would advise you to fill your mind with positive thoughts. For this you may have to stop hanging out with those who weigh you down, read positive and motivational articles or books, hang out with people who help you grow. Whatever helps you feel good and get out of that zone! Gossiping is something that could really stop you from becoming successful. Plus the successful ones never want to include themselves into any kind of gossip. If you consider yourself as one of the best, then gossiping is something that you should be avoiding entirely. Not only does it put you in the wrong light but also if the person you are gossiping about gets to know about, you end up spoiling your own impression which I am very sure you don’t want to do. Instead you should talk about things that make you look like a supportive and good human being. This is one of the worst things you could ever do. If you want to become successful in life, you need to stop making empty promises. When you lie to someone or promise something you are not going to be able to fulfil, you ruin your impression and give yourself very little scope to grow. People are obviously not going to have a good impression of you. Plus if the matter reaches your manager, they will probably not want to promote you in any way. So before you lie about making a promise, think twice! There are so many people who want to control their lives and try to influence others as well. But the sad part is, we can’t know everything about our lives and neither can we predict the future. At times, even though we try really hard, we end up in a bad situation. However, once you begin to start identifying all those things and events which are far behind your control, you will become much more accepting of what life is about to give you.! Stop trying to control your life or even anyone else’s. It could really stop you in several ways. You must also give up on all bad habits. People who are very successful often don’t have any bad habits. They don’t drink, smoke or do drugs. Instead they follow a very healthy lifestyle and you should as well. Make sure to get enough exercise every day and eat healthy. Get enough nutrition and the foods you eat are to be organic. Not only will make you feel good but also help you work better when you’re at office. The tip is tried and tested and promises to work! A lot of people in the world keep waiting for their lucky moment to happen when it never really does. You have talent, skills and time to work on it! So why waste time on waiting for something to happen? Get out there and make your dreams come true. There is so much you can do instead of just waiting there for the lucky moment to occur. You should maximize your opportunities, work as hard as you can and hopefully the lucky moment will happen soon enough! You won’t have to wait for it anymore. You don’t have to be perfect if you want to become successful. You can be yourself and do a great job. So just stop trying to fix all your weaknesses. You don’t have to be some sort of perfectionist. Most successful people in the world are not perfect at all! They have mistakes and flaws just like you. So give up on that right away and just be yourself. Enjoy, maximize your time and opportunities and don’t let anyone make you feel any different. There is no need to go around pleasing people around you. You are to focus on yourself if you want to become successful. By trying to make others happy you will be digging your own grave. You should work to please yourself and to make yourself happy. If you have to do something that will benefit you, there is no need to worry about someone else. But of course, conditions apply in cases like this. Use your mind before investing. You have to work in a team if you want to become successful. Not working in one will make you dull. You wont have any experience and wont learn anything new from them. Plus working alone might make you look like someone who is anti social or arrogant and I am sure you don’t want to create that impression in front of the audience. You have to make smart moves. So give up the idea of working alone. Work with others! You will have a lot more fun! A lot of us want to become successful but we don’t want to work hard enough for it. If you are one of them, then we would suggest you to change this behaviour right away. Not working hard will not give you the desired results. You will end up becoming a failure in the process. So in order to avoid stuff like this, you have to keep working hard. You have to give up being a lazy person and keep pushing yourself forward. Not working as much as you should, could become a real setback for you. This brings the post to an end. If you want to become successful in life, these are the things you should give up on. If you have liked the post and have some honest feedback to give, please drop in a comment below. We would love to hear from you. Also we want to hear some of your questions. It would be an honour to answer all of them. On that note, good luck and here’s hoping you’ll find success sooner than later! I love ur write up but hw can i get ur books ?